The headlines are blaring that the stock market has had the worst start to a year since practically forever, and the "Markets in Turmoil" specials are filling the airwaves. It is entirely possible that the sell-off reflects underlying risks to the global economy, but as I argue here, whatever is happening in the stock market is not adding any new information. In particular, the best course of action of the Fed is to ignore the panic, and the same holds for fixed income investors and macro-economists. The arguments to be deeply concerned about the U.S. economy are straightforward. The global commodity sector is in recession, particularly the energy sector. Oil is back with in the $30 range, which is painful for us believers in Peak Oil (ouch!). If you have a business in Fort McMurray, you should panic (that is, more than you already are). The North American unconventional oil business was in a major expansion earlier this decade, and that expansion is reversing. Commodity extraction uses a lot of heavy industrial equipment. Investment cuts will be felt by a global supply chain of capital goods producers, many of which are located far away from coal faces and oil rigs. Commodity producers will be cutting back their free-spending ways, causing a ripple effect on consumer goods producers globally. It looks like we are due for some high yield bond defaults, which tends to have a chilling effect on financing in that market. Investors had been increasingly desperate to hit return targets, which led to investing and lending standards being stretched. This exuberance could reverse as investment projects fail. The United States economy was barely growing in the first place, with the employment-to-population ratio largely stagnant. It is too late to do anything about a global recession. If it happens, a move in the Fed Funds rate 25 basis points in one direction or another is irrelevant. Nobody in their right mind treated high yield bonds as being "money good" in the first place. If the high yield market cracks, the losses will be absorbed by investor portfolios that are designed to absorb valuation volatility. Conversely, during the Financial Crisis, dubious loans were converted into "money" via securitisations, which drew into question private sector "money" in general. Much of the commodity carnage is emanating from a withdrawal of Chinese demand. The Chinese stock market is essentially a casino, and so we should not be surprised by anything it does. As for the trajectory of the economy, it is still a Communist country where the central planners have considerable scope to keep the quantity of activity moving (although one can debate the quality of activity). The stagnation of earlier "Asian Miracle" economies had only limited direct impact on developed economies. U.S. firms that were in direct competition with Asian suppliers were put out of business decades ago. 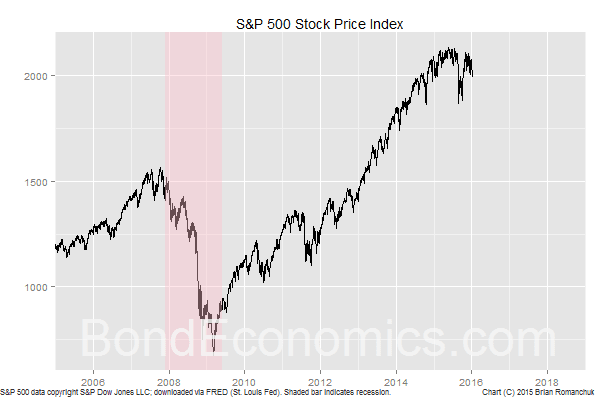 Falling stock prices excite people who own shares, but they are easily reversed. (One can eyeball the stock price chart at the beginning of the article to see lots of similar squiggles.) A financial crisis is only a crisis if there are serious defaults, which are irreversible events. A recession requires that firms get rid of excess employees. If they have not been hiring, there is no excess to be fired. However, the Fed has boxed itself in. Current projections imply rate hikes of about 100 basis points a year, which corresponds to a 25 basis point hike every second meeting. They could skip the next meeting, and be consistent with this path. Unfortunately, they did not announce a strategy of hiking every second meeting, and so if they skip the upcoming meeting, people will interpret this as the Fed panicking. Once again, the Fed should have not listened to the academics that told them that transparency was good; if they kept their mouths shut, nobody would be in a position to care about 0.25% movements of interest rates. The bond market should follow their expectations for the Fed, and also ignore the latest news flow out of risk markets (beyond the credit markets). If you think the shock to the commodity sector is big enough to drive the economy into recession, you should have already positioned yourself for lower interest rates a few months ago. If you don't think it is enough, you probably should be thinking that bond yields will be stuck in a trading range, and the lower end of that range will be reached sooner or later. As for my view, I do not have enough information to make a recession call. Regular readers will have realised that I have a "glass half empty" world view, and that I do not see any fundamental reason for a rate hike. However, I have enough faith in the "automatic stabilisers" within the economy that I see the current events just being another wiggle in the trajectory of sloppy growth that we have experienced since the end of the recession. The situation for other countries is more complicated; it depends how exposed they are to the global commodity recession. 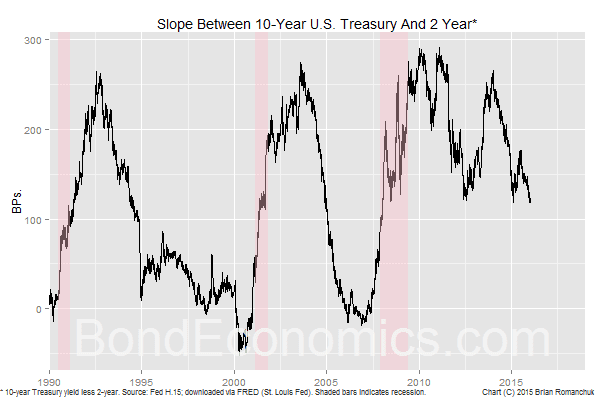 Finally, I have run across a fair amount of discussion regarding the message of the "yield curve" -- for example, the slope between the 2-year and 10-year Treasury. I doubt that there is a message. The flattening of the curve reflects the fact that rate hikes cause short-term rates to rise more than long-term rates. Long-term yields already reflected an eventual renormalisation. The fact that the curve is much flatter than was the case earlier this cycle (for example, in 2010) just tells us that bond investors had unrealistic expectations about the pace of policy rate renormalisation. On the other hand, we should not expect the yield curve to invert (negative slope). There are large institutional barriers against negative bond yields, and so the curve will not invert so long as the policy rate is still close to zero. Therefore, we will not see the usual pattern of an inverted yield curve ahead of a recession (which has been one of the most accurate recession indicators historically). One has to be very careful when looking at the non-farm payroll figures. Headline numbers and seasonal adjustments can significantly distort the data. In the case of the December figures, excluding the seasonal adjustment, the economy has only created 11,000 jobs (http://www.bls.gov/news.release/pdf/empsit.pdf, table B-1) in a much milder weather environment than previous years. This could suggest that the 292,000 seasonally adjusted number is inflated (starting from a weather-inflated based). One should also look at the number of multiple jobholders (table A-9). When looking at non-seasonally adjusted data, 259,000 workers had to get second jobs, which suggests that the workers are not getting proper wages and need to resort to second jobs to make ends meet. How can a customer spending driven economy go on like this? I dislike the Payrolls data; instead I follow the Household data, where the number of jobs is inferred from the employment to population ratio. It's noisy, especially if you look at the number of jobs, but the underlying trends are stable (and do not have the systematic bias of the Payrolls number). The employment-to-population ratio rose again, which is consistent with no slowdown in the U.S. - yet.